String and a 3.5mm crochet hook. 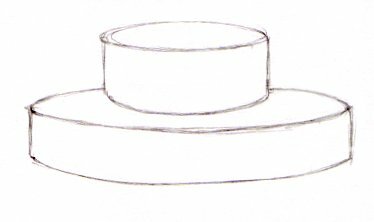 I used to have a black felt hat that was this sort of shape, and I've wanted a summer one for ages. A hat that really will keep the sun off your face. Use whatever size hook will produce a solid fabric; this shouldn't be a floppy hat. Start with a chain and join it to make a circle. I used 6 chain stitches to start - you might need a different amount, depending on yarn and gauge, but you'll only know when you've done a bit. Double-crochet into each stitch twice (single crochet if you're in the USA). You could do this in rounds, and contend with the maddening spiral seam that this produces, or you could just work in a spiral, ignoring the beginning of the round - that's what I did. Works fine. Now work 2 dc in 1 st, 1 dc in next, 2dc in next, 1 dc in next etc all round (sc's obviously for the USA). And then 2dc in 1 st, 2 dc in each of next 2 sts, 2 dc in next.... and so on. Increase the number of single stitches between increase stitches on every round till the disc seems to be wide enough for the top of your head. Check that the disc is more or less flat - this is where you might need to rip it all out and use more or less increases. I had a 6-pointed disc, but you might need 5 or 4 or 8. When the disc is big enough, stop increasing and work straight until you reach the point where a brim would be a good idea. Start working increase rounds again, lining the increases up more or less with the increases on the crown (just so they're evenly spaced; it doesn't have to be perfect). Check that it's as flat as you want; you might have to add a few extra increases in, or work a few straight rounds between increase rounds to get the right shape. Work until the brim seems wide enough. Stop increasing, and work straight for a bit. Fit the hat on and check that you can still see without craning your neck. End off. If you live somewhere windy, it might be a good idea to add a chain of crochet to keep your hat on. Or at least keep it from being blown away. LOVE the hat! Thanks for sharing the pattern. I want to try making a raffia crochet bag and next is a hat or bag with string! What a great hat. Plenty of protection and nice looking to boot. Thanks for sharing the instructions. What kind of string did you use? Just ordinary cotton parcel string.